Projects in museums have and need stakeholders to define and review their requirements and outputs and to deliver successful outcomes. Careful analysis and selection of stakeholders should be carried out referencing the scale and type of project and the culture of the museum in which the project is to be delivered. Key definitions and four tools to facilitate the process of stakeholder engagement and management will be presented. First is the identification and classification of stakeholders as contributors, creators, and consumers to ensure that no one is forgotten. Second, consideration of their likely influence over or interest in the project will start to suggest an approach to their involvement. Third, stakeholders who will influence a project can be divided into groups to be informed, engaged, or consulted. Expectations about the results of the engagement process can be socialised with them, the methods of communicating can be selected for maximum effectiveness, and their agreement can be gained. Finally, classification of the roles for the stakeholders who are part of the project delivery team can be achieved using a RACI (Responsible, Accountable, Consult, Inform) chart to define overall responsibilities for the creation and signoff of deliverables. The key premise is that clarity about stakeholder roles and responsibilities, with their agreement, at the start of the project will maximise the project’s likelihood of success. Unless you live alone on a desert island where you are in sole command, stakeholders will challenge, delight, and even frustrate you in your endeavours to create change. Adopting a pragmatic approach for planning to engage and work with stakeholders will provide a useful foundation for their involvement in any outcome you wish to achieve. First, a word of caution. No stakeholder management framework delivers an infallible recipe for success. Judgement must be continuously applied to the relentless and fluid challenge of working with people in diverse cultures to achieve changes that are bigger than individuals and that are accepted by those who are impacted by them. My focus is on stakeholders in projects rather than the ongoing stakeholder analysis and engagement that might underpin, for example, a museum’s strategic relationship with government or its community (Vergeront, 2011). Therefore, I will define projects and stakeholders, then present four tools to facilitate the process of stakeholder engagement and management. First, identification and classification of stakeholders will ensure that no one is forgotten. Second, consideration of their likely influence over or interest in the project will start to suggest an approach to their engagement. Third, stakeholders can be divided into groups based on their levels of involvement. Expectations about the results of the engagement process can be socialised with them, the methods of communicating can be selected for maximum effectiveness, and their agreement can be gained. Finally, the roles for the stakeholders who are part of the project delivery team can be articulated using a RACI (Responsible, Accountable, Consult, Inform) chart to define overall responsibilities for the creation and signoff of deliverables. The key premise is that clarity about stakeholder roles and responsibilities, with their agreement, at the start of the project will maximise the project’s likelihood of success by addressing genuine needs and being accepted by users. Examples of projects in museums include developing a digital transformation strategy, selecting and rolling out a new ticketing system, redeveloping a museum website, developing a new dinosaur exhibition, creating and presenting online a program for autistic children, and moving collections from one building to another. Projects are the opposite of “business as usual.” Projects are critical to museums because they deliver change: seamless online transactions, innovative interactives, streamlined systems and processes. Who or what are stakeholders? According to the PMI, the term “stakeholder” refers to “an individual, group, or organization, who may affect, be affected by, or perceive itself to be affected by a decision, activity, or outcome of a project” (Wikipedia, 2015). Stakeholders are individuals and groups that are actively involved in the delivery of a project or whose interests may be affected by a project. Stakeholders are key to a project’s success or failure because they are interested in, and exert influence over, the project’s objectives and outcomes as contributors, creators, and consumers. Consider a project to select and roll out a new ticketing system. Stakeholders include the project sponsor, analysts who will document the business requirements for the new system, the ticketing software supplier, the technical implementation team, customer services staff who will use the system to sell tickets on site, and museum visitors who will buy tickets online. In a project to develop online resources to create an autism-friendly museum, key internal stakeholders include education specialists, Web production team, and customer services staff. Outside the museum, key stakeholders include autism experts, parents of autistic children, and the children themselves. A major collection relocation project must consider stakeholders such as contractors who will perform the move, staff who are impacted by the noise and disruption of the move, experts responsible for the care and safety of the collection, and customers such as researchers who are disappointed by the non-availability of parts of the collection. A project manager is any person delivering a change—something new or different—irrespective of their title. The project manager must lead the work to identify stakeholders, determine their requirements and expectations through consultation, and manage their involvement toward a successful project outcome. Make a list of possible stakeholder categories (e.g., consumers, creators, contributors, champions, or blockers) to encourage breadth of thinking about types of stakeholders. Make a list of all the people or groups in each category. For each group, identify the members or nominate a representative. Review the categories and names to ensure that no one has been forgotten. Table 1: initial brainstorm for a hypothetical website redevelopment project. It is more important at this stage to identify stakeholders than categories. You probably realise that all these stakeholders will have opinions about the new website. Prior to seeking their input, you might choose to analyse their level of influence and interest in the project. Stakeholder influence and interest varies from ultimate project decision making to blithe insouciance. 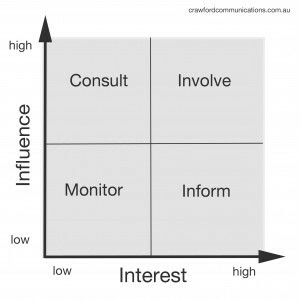 To explore project relationships, stakeholders can be mapped to an Influence/Interest grid and classified into four quadrants representing their level of influence over, and interest in, the success of the project. Here is one example (Crawford, 2014) you can adapt for your project. In the hypothetical Web redevelopment project, the project sponsor will have high influence and high interest in the project as the ultimate approver; the CEO will have high influence but less interest, having delegated responsibility; the Customer Services team may have less influence but high interest, and they will be kept informed about the project’s progress and consulted on the online ticketing components; the Facilities staff will have both low influence and low interest, so they will receive information about the project and be listened to if they express concerns. You have now identified your stakeholders and assessed their influence over and interest in your project. With this knowledge, you can begin to plan their participation in the project. Stakeholders should have a say in decisions that could affect their working lives. Stakeholder participation includes the promise that the stakeholder’s contribution will influence the decision. Stakeholder participation promotes sustainable decisions by recognising and communicating the needs and interests of all participants, including decision-makers. The role of stakeholders in a project varies depending on the nature of the project. A project to implement a new digital brand strategy across three museums is more likely to require complex internal and external stakeholder engagement than the rollout of a new lighting system in the minerals gallery. The organisational culture of your museum, irrespective of the project’s complexity, will also influence stakeholder engagement and communication. A museum that values a highly consultative culture is more likely to have an expectation of broad stakeholder participation than a museum where designated staff are accountable for delivering projects at top speed. The following four levels of participation, based on the Public Participation Spectrum (IAP2, 2014), can assist in planning stakeholder engagement. You can simplify or adapt the levels to the needs of your project based on knowledge of the stakeholders, the type of project, and the museum’s culture. More techniques for communication and consultation are available (Government of South Australia, 2014) to adapt to your stakeholder community. Project participation goal To provide balanced and objective information to assist stakeholders to understand the drivers, alternatives, opportunities, solutions, and progress of the project. To obtain stakeholder feedback on issues, analysis, alternatives, and/or decisions. To work directly with stakeholders throughout the process to ensure that their concerns and aspirations are consistently understood and considered. To place final decision making in the hands of stakeholders. Promise to project stakeholders We will keep you informed about the project’s progress. We will keep you informed, listen to you and acknowledge your concerns, and provide feedback on how your input influenced the decision. We will work with you to ensure that your issues and ideas are directly reflected in the alternatives developed. We’ll also provide feedback on how your input influenced the decision. We will implement what you decide. Messages should be clear, concise and delivered in a timely manner. Be open and honest about your objectives and planned activities. Do not make promises that are not achievable. Be direct in addressing key concerns. Use plain language and minimise jargon. Ensure the message and the method of communication are targeted to the relevant audience. By planning stakeholder participation levels and communication methods up front, you can invite stakeholders into the project with a clear statement about their involvement so they know exactly what to expect. For example: “During the project, we will keep you informed through regular newsletters and presentations”; or “We will consult you during the project by inviting you to participate in a focus group on the graphic design brief, and we’ll let you know how your input influenced the final decision”; or “As a Project Steering Group member, you will play a key decision-making role in the project through attendance at regular meetings to review and sign off project deliverables.” And stakeholders can agree or can contest their level of involvement. My favourite method for articulating stakeholder involvement in project deliverables is the use of Responsible, Accountable, Consult, and Inform statuses to create a RACI chart (PM PrepCast, 2015). The chart is presented as a matrix showing project activities or deliverables in the left column while project roles are represented across the top of the chart. This encourages clear division of responsibilities. Ideally the project manager involves team members when developing the RACI chart to encourage ownership. Responsible: Those who do the work to achieve the task or deliverable. Accountable: Also known as the Approver: the one ultimately accountable for the correct and thorough completion of the deliverable or task; the one who signs it off. There is only one Accountable role or group for each task or deliverable. Consulted: Those whose opinions are sought and with whom there is two-way communication. Informed: Those who are kept updated on progress, often on completion of the task or deliverable, and with whom there is only one-way communication. The power in developing a visual distillation of project responsibilities lies in its participative development to encourage commitment from team members. The other benefit is its clarity of communicating, to those inside and outside the project, that activities and deliverables have been planned—the project is in good hands. Table 3: an indicative example of a RACI from a project to develop a Digital Transformation Strategy. Stakeholders are human and busy; they change their minds or forget what was agreed last week. Investing time in careful planning has a significant payoff. The more stakeholders feel listened to, the more trusting they will feel, and the more invested they will be in the project’s successful delivery. The tools presented above, supplemented by the project manager’s judgement, provide a framework for analysing and engaging project stakeholders to maximise their contribution to successful project delivery.
. "Stakeholders: How to select, classify, and engage them for successful project outcomes in museums." MWA2015: Museums and the Web Asia 2015. Published August 7, 2015. Consulted .